Adhiroh Creative Signs is a new production house, based in Hyderabad., started their first venture to day at 10.00 am at Rama Naidu Studios. Producers sri Allu Aravind, Gemini kiran, sharrath Marar, sreenivasaraju, Directors Chandra siddhardha, Karunakaran, kishorePardhasani(dali), jonnalagadda sreenivasaravu, sreeraam balaji, Musi Director koti an sri Professor G,Sreeraamulu Participated for this grand gala function and wished the unit for the grand success. 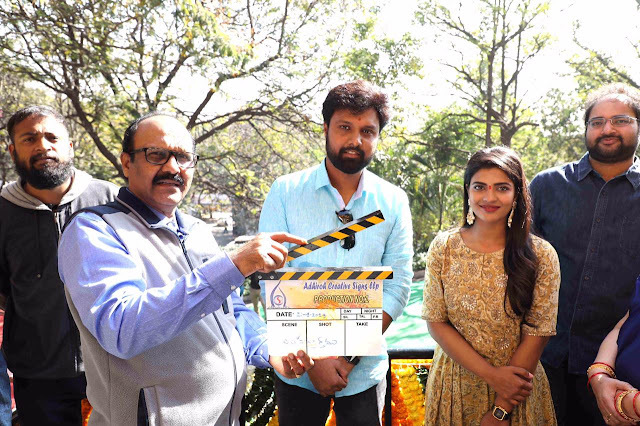 The hero of the film is Udayshankar of ‘Aata Gadara Shiva’ (Telugu) fame and the heroine is Aishwarya Rajesh of ‘Kaka Muttai’ (Tamil) and ‘Kanna’ (Tamil) fame, (she is the daughter of late Actor Rajesh). Director NV Nirmal Kumar is debuting in Telugu. He has directed the Tamil superhit film ‘Salim’, ftg Vijay Anthony. The Cinematographer is Ganesh Chandrra. The story is by Bhupathi Raja, a story writer of many a hit fame. Adhiroh Creative Signs is introducing a new Music Director Gifton Elias through this film. The storyline of the film is a holistic family entertainer with a sports element being dealt with. The film started rolling from today and shall continue in various schedules running through the months of January, February, March and April. The locales would be in both the Telugu States culminating with a schedule to be shot abroad. The remaining cast is Sanjay Swarup, Pradeep Rawat, Roopa Lakshmi and others.